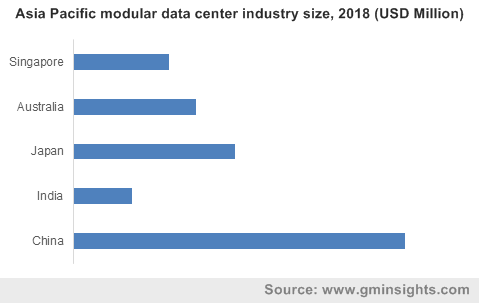 Modular Data Center Market size valued at over USD 13 billion in 2018 and will grow at a CAGR of around 23% from 2019 to 2025. The rise in the demand for energy-efficient and portable IT infrastructure facilities is driving the modular data center market growth. Several businesses are incorporating prefabricated and containerized facilities that streamline the IT operations and offer enhanced performance. These facilities provide high power and cooling efficiencies to businesses in comparison with large-scale facilities. Confined spaces of prefabricated facilities are easier to cool than large IT rooms, as they have a built-in aisle containment that minimizes hot & cold air mixing. Cooling enables operators to maximize the capacity of their IT space. The manufacturers in the market are developing sustainable products by incorporating energy-efficient technologies. For instance, Huawei Technologies Co., Ltd. is offering FusionModule1000B that includes integrated power systems and energy-saving air-cooled or water-cooled in-row cooling system. Similarly, SGI is offering Ice Cube modular IT facility that helps businesses to reduce the cooling costs. The proliferation of digitalization coupled with the increasing number of businesses has led to a rise in the number of data centers globally. There is a growing trend of adoption of modular facilities owing to various advantages offered. 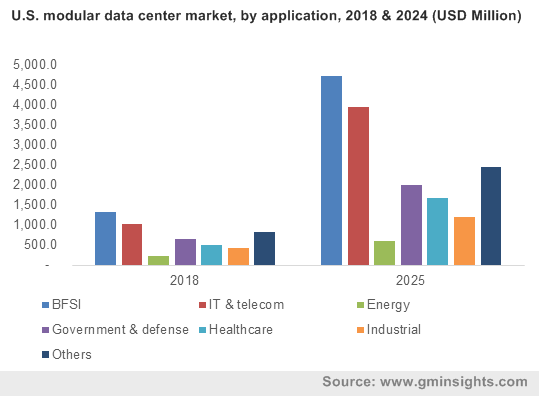 The rising need to reduce the complexity of conventional facilities is paving way for the introduction of prefabricated data centers that facilitate scalability and easy deployment, boosting the modular data center market growth. The mobility of facilities allows consumers to relocate their systems instead of dismantling them and constructing new facilities at new locations. Prefabricated modules address the customers’ capacity requirements with a fast deployment time. Additionally, these facilities provide high density, low Power Use Effectiveness (PUE), and significant cost & time saving owing to the relatively low time needed in deploying them. Such factors are positively impacting the market growth. The services segment is anticipated to grow at a CAGR of around 25% from 2019 to 2025. The modular data center industry is witnessing a high demand for maintenance & support services owing to the growing implementation of modern solutions for improving the IT performance. Several IT managers are replacing their legacy power & cooling solutions to install smart IT management & monitoring technologies. These facilities require highly skilled experts for periodic maintenance tasks. The businesses are depending on service providers for reducing the additional expenses of hiring technical staff and the establishment of a separate IT department. The market players are also offering consultation services to customers, allowing them to incorporate scalable IT equipment matching their business requirements. It includes facility design, implementation, energy, power, and cooling consulting services. Increasing data management requirements from the government & defense sector will provide an impetus to market growth. The sector requires scalable and reliable IT infrastructure facility to store, manage, and secure the confidential information related to policies and political or economic data. The military sector is dependent on these facilities due to its fast deployment and increased portability. Moreover, government agencies are facing constant pressure to deliver fast & enhanced services to meet the increasing demand for constituents. A reliable infrastructure is crucial as government organizations are going digital, boosting the modular data center market demand. In February 2019, the U.S. Army announced its plan to deploy two prefabricated facilities in Iraq for improving the data communication system within the military units. Manufacturers are developing IT facilities specifically for military purposes. For instance, PacStar MDC developed by Pacific Star Communications, Inc. can be deployed in command posts, FOBs, aircraft, and ground vehicles for intelligence, military, law enforcement, and homeland & security uses. In 2018, the Asia Pacific market accounted for around 20% of the industry share. Increased adoption of these IT facilities in SMEs is a major factor propelling the regional market growth. Rapid urbanization, government support, and economic resources are the major factors responsible for the increased number of SMEs in the region. These SMEs are transforming their legacy systems with modern technologies to enhance business operations in minimal expenses, accelerating the market growth. Moreover, the government administrations are encouraging and promoting enterprises to incorporate such innovative technologies. For instance, the Energy Conservation Act, developed by the Government of India directs and promotes industries to incorporate energy-efficient technologies in their business operations. Increasing demand from citizens for improved transparency and accountability will drive the modular data center market. The rise in population and urbanization in several countries in the region have led to the mounting pressure of managing the data generated. 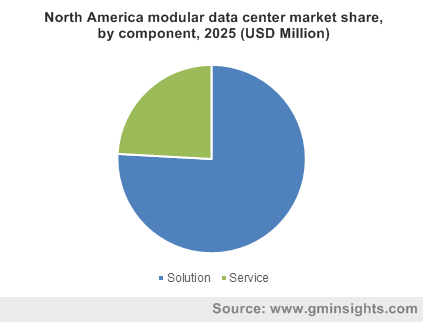 Key players operating in the modular data center market are Rittal GmbH & Co. KG, Cisco Systems, Inc., IBM Corporation, Huawei Technologies Co., Ltd., Commscope, Inc., Baselayer Technology, LLC, Schneider Electric SE, The Hewlett Packard Enterprise Company, Dell, Inc., SGI Corporation, IO Data Centers LLC, Flexenclosure AB, BladeRoom Group Ltd., Cannon Technologies, Eaton Corporation, Vertiv Co., and STULZ GmbH, among others. Manufacturers are developing customized solutions for their customers based on their business requirements. For instance, in January 2015, Emerson Network Power developed modular IT facilities for T-Systems in Spain consisting of around 300 racks, 38 integrated modules and modular capacity of around 1.1 MW. The facility meets the business requirements of T-Systems for scalability, rapid deployment, security, and efficiency. Technological advancements and innovations in the market are the major competing factors among the players. Manufacturers are developing intelligent technologies that are enhancing the data storage and processing tasks with maximum efficiency and accuracy. In July 2018, Huawei announced the launch of intelligent modular IT facilities that feature several advantages such as easy installation & maintenance, capacity expansion, and rapid deployment. Existing players are focusing on collaborations & partnerships to strengthen their hold on the market, making it harder for new entrants to gain a foothold in the market. In April 2017, Huawei partnered with Global Switch Corporation to build IT facilities with smart & innovative technologies such as iCooling, iPower, and iManager.